E is for Explore! 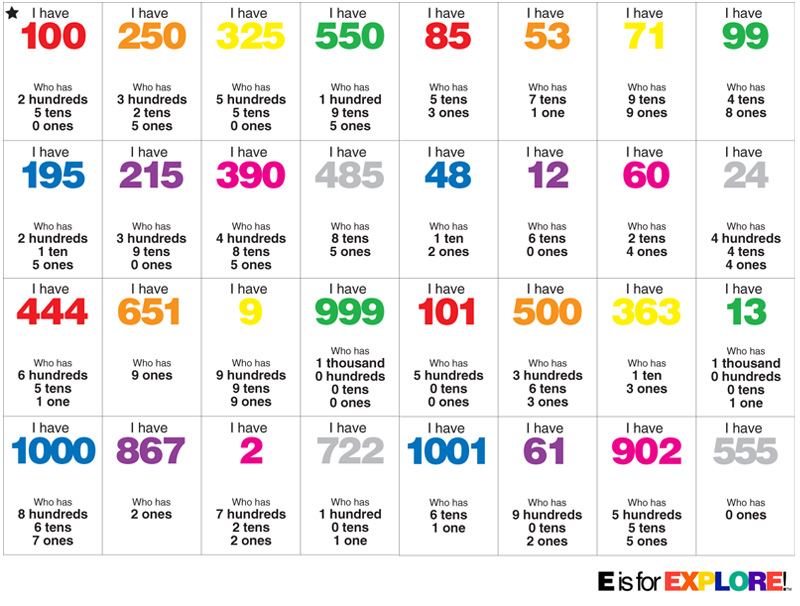 : Place Value, Who Has? I Have, Who Has Place Value cards are a fun way to get students interacting with one another. This activity is great for kids to recognize numbers in and out of standard form. Erin, do you have a printable version of this you could send to twoboysandacricut@gmail.com? Also, are there directions. I've seen the I Have/Who Has games but haven't actually used them with my son yet. This is wonderful! Is there any way to get printable versions of these activities? HI Erin. Love the idea! Would you please send me the pdf for this activity? Much appreciated. I would love a printable version too! Yes please! Can I have a copy too? dgabler@queenbee16.org Thanks! I would love a printable version too please! Love the idea! I have/who has helps strengthens listening skills (and my new 3rd grade kiddos need lots of strengthening help)!!! This is so cute! I would love the printable! Perfect! I would love the printable, too! Thank you! I would love the printable too! Hi! This is great! I too would love a printable version! Thank you so much! Can I have a printable version as well? Thanks!!! I would appreciate a printable version too! This is great! Great blog! I love the "I have, who has" series. Could I possibly also get a copy of this? What a great and fun way to reinforce place value. I would appreciate a copy as well. I would love a PDF version of this activity. Would you be able to email it to mariag_1991@yahoo.com? Erin, Did you end up making a pdf? Where can I access it? I would love a printable pdf, if you have it. This is perfect for my class! karamw @ leeschools.net Thank you! If you would be so kind to send me a printable version, I would be eternally grateful! sarah.lozano@hcisd.org. Thanks!